Is ‘Hope’ the new hot button? Many people are becoming numb to the world’s problems, and retracting into their cocoons. Something that brought that fact into sharp focus for me was this� I was reading the newspaper at breakfast, and as I flipped through the various sections looking for something interesting to read, this headline caught my eye: “Humanity’s survival at stake: UN”. It announced the UN’s 572-page report, Global Environment Outlook. Hmmm. Isn’t that curious? Humanity’s survival at stake is not front page news! The front page stories were about the soaring loonie (the nickname for the Canadian dollar) and a hot, young hockey phenomenon, John Tavares. Does humanity’s future being bumped by the loonie and a fledgling hockey star sound loony to you? I don’t know� It must be a defensive play to sell newspapers. The editors know the public can only take so much bad news before we shut down and lose all hope. So they push in our faces the stories they think we really care about. Money and celebrities trump humanity’s survival. At times, I fear we are like the proverbial frog in a pot of boiling water. 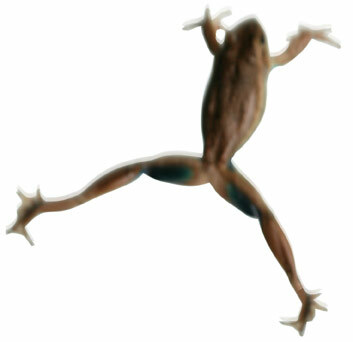 The story goes like this� If you throw a frog into a pot of boiling water, it will jump out. 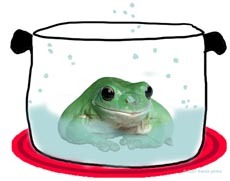 But if you place a frog in a pot of warm water and gradually turn up the heat, it will very happily boil to death. Because the frog’s survival instincts are only triggered by sudden changes. And so it is with climate change. We’ve heard many warnings about climate change over the past 30 years, but somehow we are deaf to them, and unaware of our impending doom. Well, clever marketers, artists and writers sense the water is getting a bit too hot, and are serving up the solution. This new crop of “Hope products” could be just what the world needs to inspire action and jump out of the pot. So where am I seeing evidence of hope? Seemingly disconnected dots have started joining up and a pattern is emerging… Is it a trend? In the past week I’ve been to a book launch for Geography of Hope (which gives us hope by showing signs of a sustainable future unfolding around the world). I also attended Chest of Hope, an art exhibit raising funds for cancer research (which rekindles the hope that cancer can be beaten if we all pitch in and contribute to medical research). Hope is an emotion that savvy Breast Cancer fundraisers have used for many years. Even the packaging on my favorite whole wheat bread features the familiar pink ribbon and a Harvest of Hope campaign to raise money for the cause! But hope is too powerful a force to be owned by any one cause. Marketers know that hope sells — and some would argue (me included) that the environmental movement could motivate more people by injecting ‘hope’ into their message. Humanity’s survival is at stake — but too many people are tuning out the message. How are we going to flip this around? Personally, when I read about a successful green project it inspires me and gives me hope that perhaps my efforts are not wasted. Hope as an inspirational force is springing up everywhere. I also read news articles about actress Hilary Swank and shoe/clothing designer Kenneth Cole who have jumped on the hope bandwagon. Each promises to tell us how to achieve our dreams (if we buy tickets to their Power Within events in Vancouver and Toronto). But the dilemma is we need a lot more Vanier’s, Turner’s, Gampp’s, Swank’s and Cole’s to get us to wake up and jump out of the pot! The big question is: Are you ready to take action? Can you plant a few seeds which will offer the world hope? Thanks for pushing the hope button!